← The Great Partridge Race and How We Do Wine! I’m often asked what happens in our house on Christmas Day – who cooks, am I sick of Turkey already, is it just a busman’s holiday? The truth is this… I love Christmas! I really do. We open for Christmas Lunch in 63 Tay Street and we’re always very busy. So it’s up early with the kids to see what Santa’s delivered, Christmas Breakfast in the house and then down to the restaurant to get ready for the big meal. 25th December is the only day of the year you’ll eat Turkey in 63 Tay Street; over the course of the month we do other festive flavours and give dishes a Christmas twist but the Turkey – like any great act should be – is reserved for “One Night Only”! As you might imagine we source a local, free range Turkey for the occasion – this is also what I’ll serve at home later in the day! Good turkey should be almost gamey and if I had one piece of advice to give I’d say spend less on Christmas tat and a bit more on a posh bird! When it comes to flavour and texture it’s always worth the extra. Hugh Grierson’s do a good organic one. 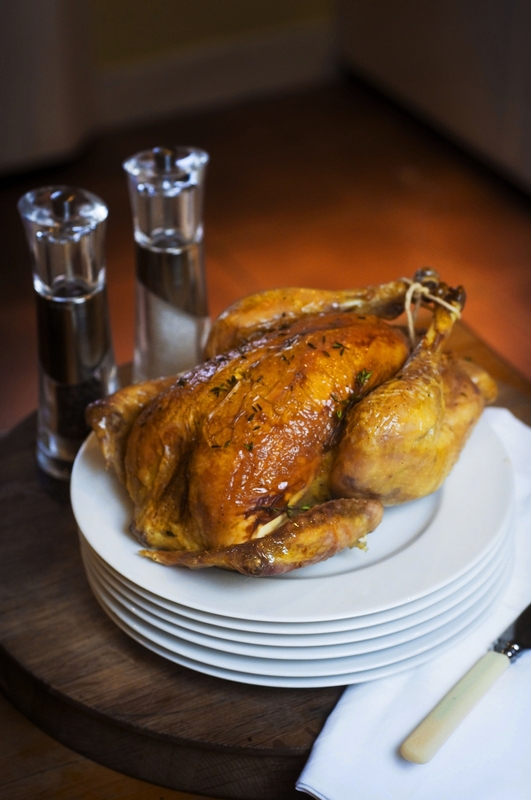 Hugh Grierson Organics do a Perfect Perthshire Bird! Thanks to Sascha for the Pic! After I’ve fed everyone else’s family, I go home, pour a glass of wine, get comfortable and start dinner for mine. And no, it doesn’t feel like a busman’s holiday. I love cooking for my family, I love the fact that we’re all together, sitting down and enjoying a meal. Fiona and I have the same pressures as every working parent. Fiona works at the restaurant with me and it’s hard to find time to just sit down and do nothing! You’ll see us in a flurry of paperwork, running the kids around various clubs, putting tea in the oven, counselling serious issues such as who pulled who’s hair first, calling repairmen…and often with little more than a High Five on the way past each other! So at Christmas it’s all about us! Mum and Dad’s taxi service is in the garage, hair is left well alone thanks to crackers and we’re relaxed in the day; just one happy, full, contented bunch. Cheesy? Of course. That’s what Christmas is all about! What might surprise you is that I have the same Christmas fear factor as everyone else – will the spuds be crisp? Will the turkey be moist and juicy? Will they like it?! Thankfully, it’s always come together. We’ve never had to drag the car out of the garage and go down to raid 63’s fridges yet! As I said at the start, I love it. And it’s got me thinking. Perhaps we should all make an effort in 2013 to make more time to sit down as a family. We’re as guilty as the next parents with young kids! But that special feeling of breaking bread, laughing, chattering children…it shouldn’t be once a year. The family shrine should be the table – not the damn TV! Life is fast but food could be our moment of calm, to sit down for an hour and forget the pressures. I’m thinking a Scottish Family Sunday Club… and I may have it all worked out by the next blog! Leave your comments – I’d love to hear them! Right, I’m off to ask my wife if she knows where my Santa Hat may be lurking! Have a wonderful Christmas whatever you do, we’ll chat in 2013!